So, anyone who has known me for longer than a day (less in the summer months), knows that I have an obsession with body odor. I am always worried about being less than fresh in the arm pit area. I think I take my thoughts and judgements that I place on others and then obsess about them and make sure I am not one of those people. I just really can't understand how someone can have less than pleasant body odor. Good hygeine es muy importante. 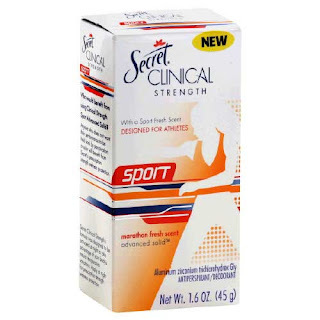 Secret Clinical Strength Sport. The name of the scent (Marathon Fresh) confuses me because I don't know how fresh you would smell after running a marathon. But maybe it means that you will smell fresh even after running one with this stuff. Not only does it work ALL DAY LONG on regular days, but also on hot summer days spent in the pool or on a boat (which has always been an even tougher challenge for me). Not to mention it has a delightful scent. Sometimes I get a whiff of it throughout the day and it's everything I can do not to start sniffing my armpit. I stumbled upon this little gem at Girlfriend's house after a day of being out in the sun with my regular old former deoderant. Obviously I needed to reapply, so it's clear it was not working very well. I kept getting whiffs of it throughout the day and really enjoyed the scent. I thought, next time I need deoderant, I am going to try it. I almost changed my mind when I saw it was about $8 for a small thing of it, but let me tell you, it's more than worth it. You know what's funny, that stuff does not work for me at all. I have yet to find one that works. Maybe I need to try it again, and give it a longer chance than a week.